When it comes to steak I found that really, less is more. You should temper with the taste as little as possible when it comes to spices. The best way to add flavor is to serve something on the side, like fried shallots with garlic, stewed in a cup of red wine. – Pick out a good cut of meat in the store – make sure it has good marbling. If you are not sure about what to pick consult someone in the meat department. – Wash the meat. I like to rinse my meat under cold water – you never know where it’s been. Pat dry with a paper towel. 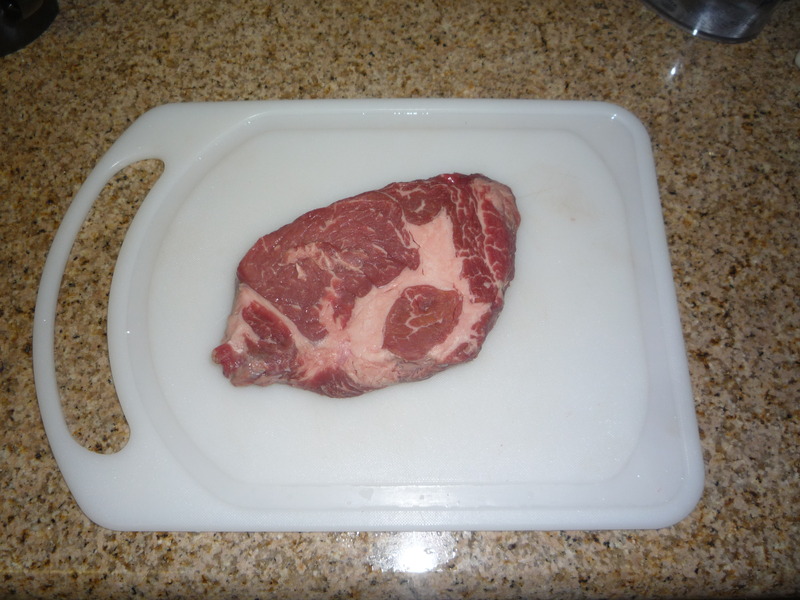 – Put your meat on a durable cutting board. 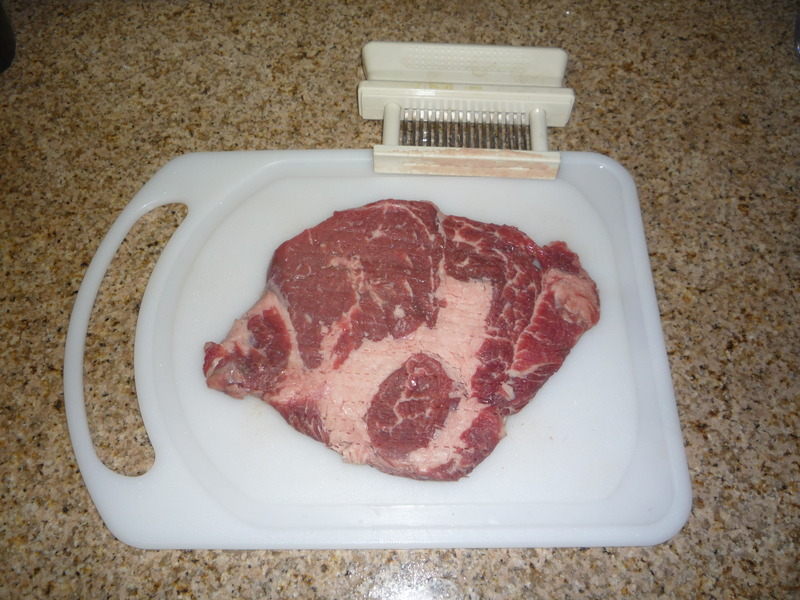 Tenderize it with a meat tenderized that has either blades or prongs. Tenderize it on both sides. 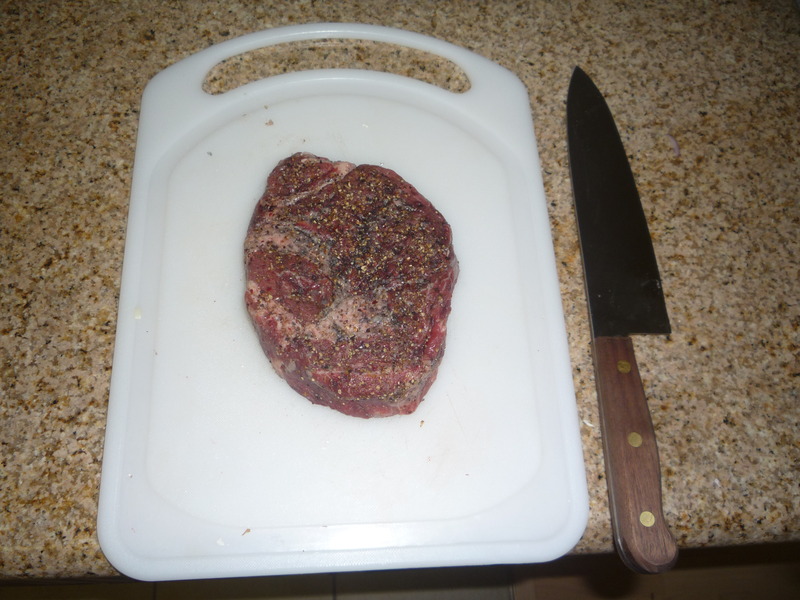 – Continue working your meat with tenderizer until it is flat and about 1.5 to 2 times its original size. – Spices: truly salt and pepper is all you need, preferably coarsely ground. My home pepper grinder has whole coriander seeds mixed in, which gives my steak a pretty good flavor. If you want to add more than salt and pepper try to limit yourself to one more spice, two spices only if you absolutely must. – Let the meat soak in the spice rub for about an hour. – After an hour has passed, pull the stretched spiced meat together into its original size. Cook it on a clean non-stick frying pan, on medium heat, 3 minutes on each side, with lid on. Cook until it reaches desirable temperature. USDA recommends 160F, I cook my meat to 150F–155F. 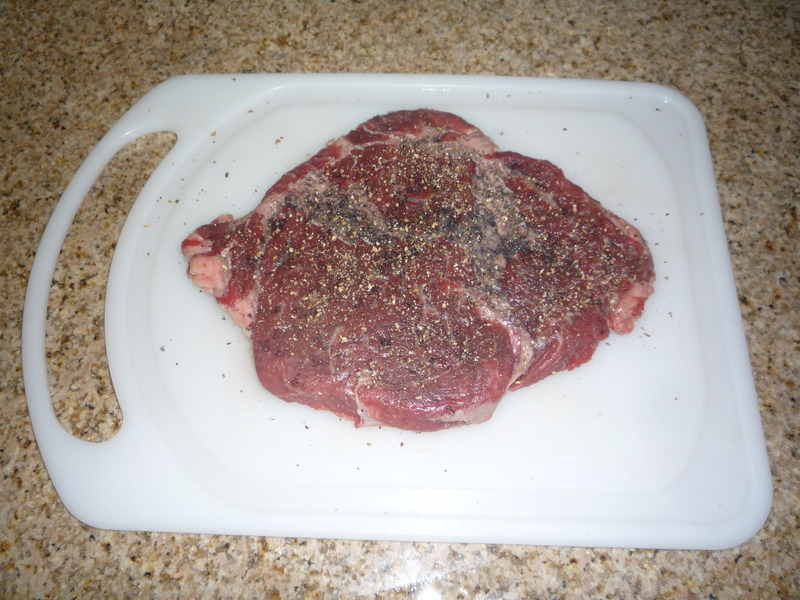 – After the steak reaches the proper temperature, immediately transfer it to a plate. Let it rest for 5–10 minutes before cutting it, this will assure it stays juicy. This entry was posted in In the Kitchen and tagged Add Flavor, Blades, Clean, Coarsely Ground, Consult, Cook, Coriander, Cut, Flat, Flavor, Garlic, Good, Good Cook Advisory, Good Cut, Good Flavor, Good Marbling, Good Steak, Ground, Less is More, Limit, Marbling, Meat, Meat Department, Medium Heat, Men, Pat Dry, Pepper, Prongs, Red Wine, Rest, Salt, Seed, Serve, Shallot, Side, Soak, Spice Rub, Spices, Steak, Taste, Tenderize, Tenderizer, The Perfect Steak, USDA, Wash, Whole Coriander Seeds. Bookmark the permalink.